Reviewed on: 21st April, 2011. Presentation: The graphics and sound effects are very fitting to the setting and it looks very polished for an indie title. I particularly liked the good use of contrast on route-planning maps with the enemies coming up bright red against the blue backdrop and the interesting choice of setting (the cities of Baghdad and Tokyo) means the mission visuals don’t get boring quickly. Atmosphere: The atmosphere is dark with the overall narrative seemingly describing a tale in retrospect (i.e. a cutscene ending with “I know, I was there”). It’s a little more plot heavy that these sorts of games tend to be, the atmosphere is tense, even if the soldiers under your command have a bit of a jockish attitude. Control and Mechanics: The controls would be fine with any use of the mouse and a single key press. A few keys are used to access menus during the game (such as purchases or special abilities) but the game pauses at this point, allowing you to make your selection at leisure. 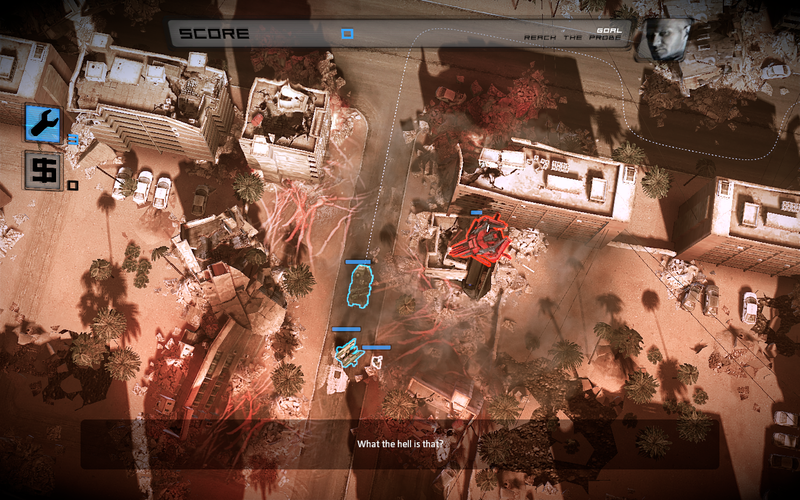 The game also pauses during tactical map mode, allowing planned movements. Who should buy this: Anyone who likes the tower defence genre and wants a new breath of life added to it. Anyone who likes the MOBA-style game of having one directly controlled character with special abilities, but placed to the role of a support character aiding and directing troops. Anyone who wants a game that really succeeds in doing something different. Who should avoid it: If you really don’t like tower defence, you probably won’t like this inversion of the formula (but don’t hold me to that). If you don’t like thinking on your feet or the tense, last minute changes your plans will require, you could do better elsewhere. If you want multiplayer too, this game won’t be for you. Tower defence games are, alongside MOBA games like League of Legends or Heroes of Newerth, one of the two genres to descend from a Warcraft 3 mod (and, arguably, the first MOBA game) commonly called DotA (shortened from Defense of the Ancients). In tower defence games, your aim is to construct defences against a set number of enemies marching along a set path or paths before they reach a certain target or do a certain amount of damage. There have been a lot of these games popping up in the last few years. Games like Defense Grid: the Awakening or Revenge of the Titans have done interesting things with the genre but there is only so much that can be done with a genre that consists in taking out a set number of enemies along a set path with finite defence configuration possibilities. The thing that A:WE brings to the table is that it inverts the play. In this, you are the force trundling along the ground being attacked by enemy towers and weapons trying to stop you from reaching a certain goal. The setting is that in 2018, two objects fall from the sky and land in the cities of Baghdad and Tokyo, each forming a large shield of energy that envelopes much of the two cities. Six months later, at day zero, your team enters a crack within the shield at Baghdad and it all goes downhill from there as the alien presence within the dome has grown, leaving the city inside a wasteland. Navigating your way through the cluttered streets does give one a real sense of being in command of a tactical operation. You only have direct control over your commander unit, as in MOBA games, but can direct which routes you take through the city to optimise your attempts to reach your goal. Each level gives you medals based on the efficiency and directness of your mission completeness, which adds the temptation to occasionally take that more dangerous route for directness or hold off that repair until the last minute for efficiency. Add a healthy dose of achievements to this mix (the game has 42 on Steam) and you have a lot of replay value there. 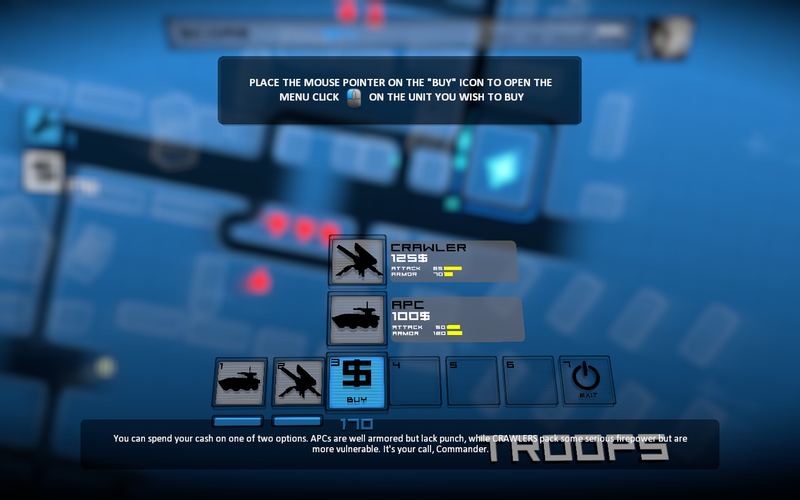 You also have the fact that individual units can be bought and upgraded with a variety of options being available to your convoy as you progress. The layout of your troops can be adjusted to put a line of damage-absorbing units at the front or a set of heavy-hitters depending on for what the situation calls. Your command unit can scout out ahead in his combat suit to collect upgrades that give his suit to ability to do a variety of things such as repair units (the most used ability given the damage they will take). These help you through the imposing enemy forces and it really is a buzz when you take down that first dangerous foe or wipe out a line of towers. The only criticism I do have of the game is the relatively small number of game modes. It’s the sort of game that I felt lent itself to a variety of different styles of play and would have been excellent with more mod potential and multiplayer elements, but these are lacking. For the modest price tag, especially, this criticism is a minor one, but it seems like such an obvious thing to miss out. Overall, a great game and a fine addition to a cluttered genre that comes as a breath of fresh air. For the small price tag, it is a great addition for anyone who is a fan of the genre or just wants to try something new and original. Anomaly: Warzone Earth is out now and available for several platforms, priced £8.99. The website is here. Be warned that the Gamers Gate version has SecuROM.